We are proud to be involved in a benefit concert for the Santa Barbara and Ventura Community. 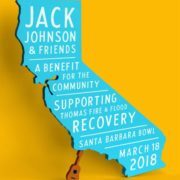 Jack Johnson and Friends, a Benefit for the Community will take place Sunday, March 18th at the Santa Barbara Bowl, in support of ongoing Thomas Fire and Flood recovery efforts. 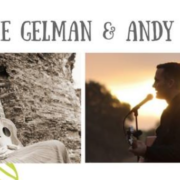 join us Friday night as we head over to our other favorite venue, the wonderful Ojai Arts Exchange for a night of celebrating with friends and family and more friends! 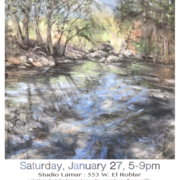 Located at Studio Lamar: 553 W. El Roblar. Music. Paintings. Raffle and Auction. We’ve all been through a lot this past month, many are still affected and unsettled. 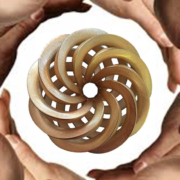 Come cleanse, connect and restore together. benefit show featuring a wide and crafty range! 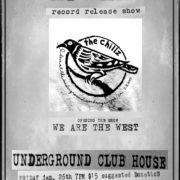 some local brass, gold & silver throated tunesmiths in the form of The Hand-Me Down Band /Oxnard, Grace Fellows, & Bonnie Boy. 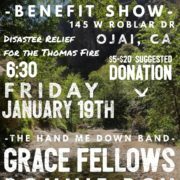 proceeds go to the greater goods disaster relief fund. A community Handmade Makers’ Market at Poco Farm in Meiner’s Oaks. 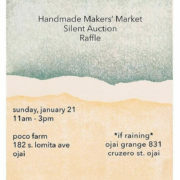 Originally scheduled for December 5, we are so honored to be part of this event and so grateful to Poco Farm and all of the makers for participating in a silent raffle to raise funds for the greater goods disaster relief fund. Raised in the old West Village, NYC stomping ground of songwriting greats, Natalie Gelman grew up amidst artists and true bohemians. 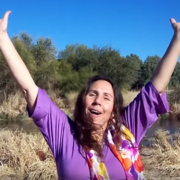 drop the shame & fear & embrace a most personal & primary instrument, your own voice… a nurturing & freeing process led by the amazing vocal sound healer, dr. gwendolyn mcclure. 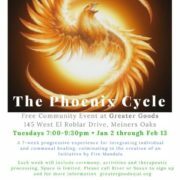 join brian & lisa berman for this free, weekly series focused on finding & building peace in the midst of so much natural disaster. 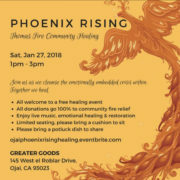 Fellow community members, River and Susan invite you to sign up for this free event that they are offering to our community as we re-group after the fire.